Whitaker Institute hosts the editorial office of the Human Resource Management Journal (HRMJ), one of the leading international HRM journals. 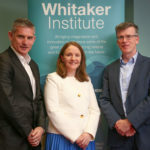 Professor Tony Dundon (Whitaker Institute and the Discipline of Management at the J.E. Cairnes School of Business and Economics, NUI Galway) has been Editor of the HRMJ since 2008, along with Professor David Collings (Dublin City University, formerly of NUI Galway) and they have been more recently joined by Dr. Adrian Wilkinson (Griffith University, Australia). The HRMJ is a leading international outlet in the field of human resource management. Published by Wiley-Blackwell, it publishes four issues annually and the journal’s debut 5-year impact factor is 2.738, and a 2-year impact factor of 1.860 ranking it as one of the top journals in ISI’s Journal Citation Reports ‘Industrial Relations & Labor’ category. HRMJ has also been elevated to a 4 band ranked journal in the Association of Business Schools’ Academic Journal Guide 2015. The Human Resource Management Journal publishes peer-reviewed well-written, well-researched and well-informed articles on any aspect of employment studies but especially those focused on issues related to the management of people at work. Published articles appeal to practitioners and academics alike by virtue of the Journal’s focus on contemporary issues, the sound use of theory and research and well-founded conclusions and practical implications. The HRMJ is the only journal officially endorsed by the Chartered Institute of Personnel and Development (CIPD).